Are you ready for the ultimate dessert? This Neapolitan Cheesecake Cake will knock your socks off! ENJOY! This cake was a true labor of love. And by labor I mean, I had to NAIL DOWN the perfect recipe for you guys. Here’s the deal. The first round of making this cake, I made each layer from scratch. So I had to create a small batch chocolate cake and a small batch strawberry cake. And then make the cheesecake center. When I was done, I loved the flavor, but the strawberry cake layer wasn’t very pink. So I covered it in HOT PINK frosting. Not on purpose, but because I added too much gel food coloring. UGH. It’s quite pink, am I right? Well, after staring at the photos and eating the delicious cake, I began to second guess myself. So I went back to the kitchen. I really wanted that top layer to be pink, not grey…and I wanted the frosting to look edible, not like cotton candy. 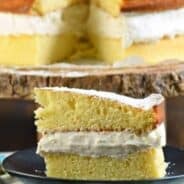 I grabbed a couple of boxed mixes out of my pantry and decided that this cake has enough flavor in each layer that it’s okay to go the easy route. The only problem I had with the boxed mixes is they make TWO layer cakes with each box. I only needed one layer. It’s a good thing cakes can be frozen. And it’s a good thing you have me around to help solve this extra cake dilemma (#firstworldproblems). You can either make a few nice big Cake Shakes (highly encouraged)…or come back later this week for a second recipe using those leftover cake layers!! First, you’re going to want to bake the cheesecake layer. I do this a day or more in advance, and freeze the finished cheesecake. This keeps it fresh, but also by adding it the cake while frozen, you don’t have to worry about a delicate cheesecake while assembling and frosting. It doesn’t take long to thaw, so by the time you’re done, it’s ready to eat fairly soon (or refrigerate the entire cake until dessert time). 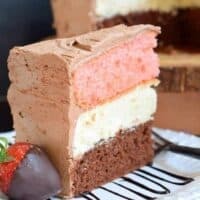 When it’s time to assemble, start with your chocolate layer, then frozen cheesecake, and then the strawberry cake layer. Be sure to save those extra cake layers for a Neapolitan Trifle (they can be wrapped in plastic wrap and foil and frozen for later use). For my final cake, I used a sweet chocolate frosting, whipped until creamy! 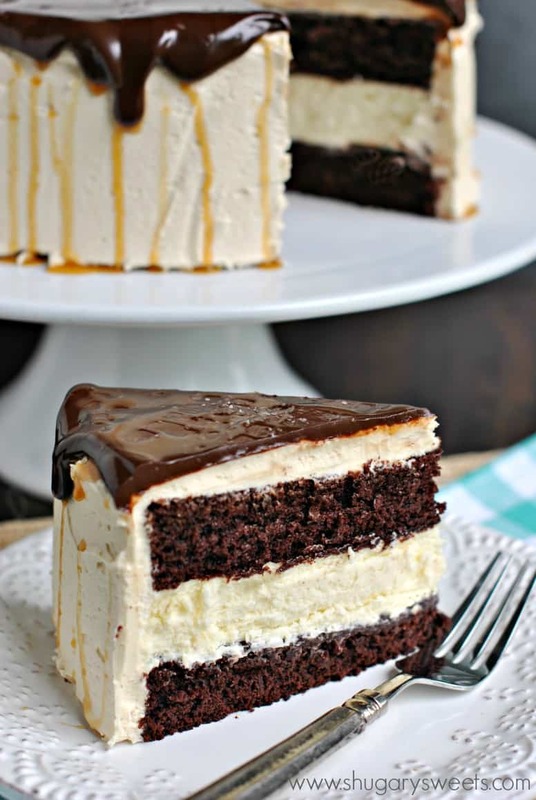 Normally I like a thick frosting layer on my cake, but with cheesecake cakes, you want each layer to have flavor. So I went a little lighter on the frosting. I also may have eaten some off the beaters. Now, who are you going to make this cake for?? To begin making this cake, make sure you read all the directions completely before starting! I begin by preparing the cheesecake layer. Preheat oven to 325 degrees. Place a large roasting pan with a few inches of water in it on a rack in the lower 2/3 of the oven. Prepare 9-inch springform pan by placing a piece of parchment paper on the plate portion of the pan. Tighten the ring and set aside. Beat cream cheese with granulated sugar for 2-3 minutes until creamy. Add in salt and eggs, one at a time, beating well after each addition. Beat in sour cream and vanilla extract. Pour into prepared 9-inch springform pan. Place in preheated oven on middle rack. Bake cheesecake for about 50 minutes, until beginning to brown. Turn oven off and allow cheesecake to sit in oven for an additional 45-60 minutes. Remove from oven and cool completely on counter. When cooled, using a butter knife to run along the edges of the springform pan and release the cheesecake. Cover the cheesecake with plastic wrap and freeze until ready to use. Prepare chocolate and strawberry cakes according to package directions, in 9-inch cake pans. You will only need one layer of each cake for this recipe, so you can store the extra cake in the freezer for a later date. Beat butter for 2-3 minutes until pale yellow. Add powdered sugar, cocoa powder, chocolate syrup and milk and beat for an additional 5 minutes, scraping down the sides of the bowl as necessary. Place the chocolate layer cake on the cake platter first. Remove the plastic wrap from the cheesecake and place top side down over the chocolate cake layer, Remove the springform pan plate and peel off the parchment paper from the cheesecake. 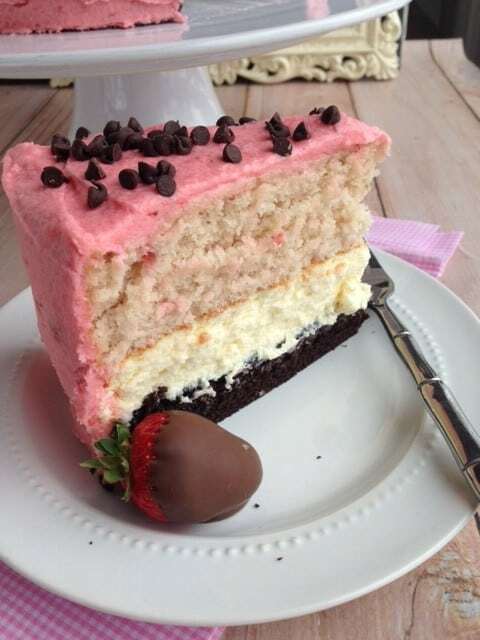 Now top with the layer of strawberry cake. 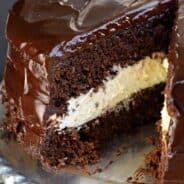 Cover in chocolate frosting and enjoy! I dipped fresh strawberries in melted dipping chocolate to use as a garnish. ENJOY. 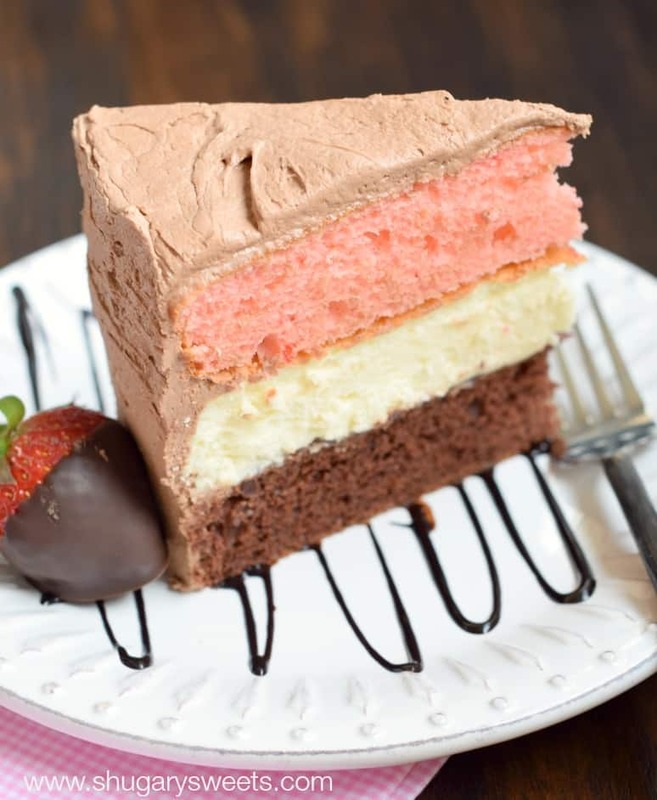 Love Neapolitan desserts? 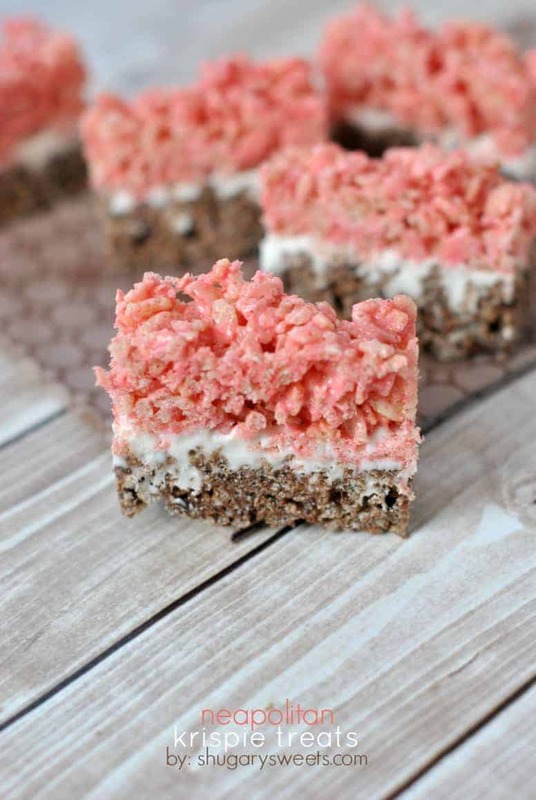 These layered Rice Krispie Treats are so delicious! Omg, yes! I love this! 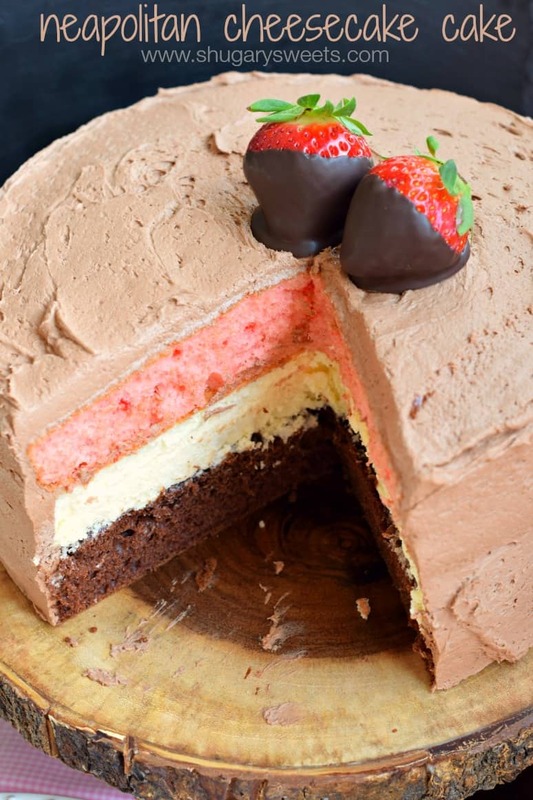 Neapolitan can be so hard to get right – the pink is the hardest! And the icing color totally gets darker as it sits. Beautiful finished cake! Aimee, this cake totally sounds like a labor of love, but I am so glad you went back into the kitchen because I LOVE the finished version! What a beautiful cake! Love the neapolitan flavors! Having extra cake in the freezer can never be a bad thing, right? You did a beautiful job on this cake, Amy. It’s lovely. What a lovely cake and such a great idea to freeze the second layer of cake to use in the future, sometimes I forget that. What’s better than cheesecake? 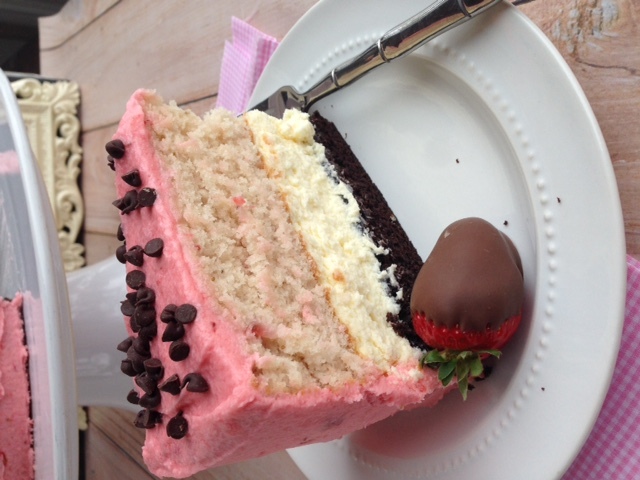 THREE LAYERS of cheesecake! So worth the effort! Wow. This one is a stunner! It must’ve been tough to start again after the first cake, but now I bet you’re glad you did! And freezing the cheesecake is a great idea and breaks up the steps. Love it! This looks AMAZING! I had a craving for Neapolitan ice cream last week and had to go buy some. Of course, as a kid I told my mom I didn’t like it! lol! This cake is so over the top! Amazing!!! Why is it that us food bloggers always have to be perfectionists?? I redid a recipe just yesterday because the photos didn’t turn out right. I guess we’re just two peas in a pod! And having extra cake around is no problem for me… Just my skinny jeans. 😉 Thanks for the link love Aimee! Pinned! Can I borrow your friends?? 😉 I still haven’t met very many people after moving; I need to get on that so I stop eating so much sugar! I think I remember you mentioning that you donated some treats to the fire station… Is that true? Because I now live two stoplights away from one, so that’d be perfect! We haven’t met many new people yet either. But we moved back to our old town, so that made it easy (cause we do still have friends here)! They would take your treats any day. I haven’t given to the fire station, but that’s a great idea!!! I know many others who do that. Moving back home is the best! So glad you and your family were able to do that. 🙂 We started out in a college town, so most of our friends moved away to bigger and better things shortly after graduation. Not much to move back to! I’ll try the fire station sometime soon; thanks! This cake is gorgeous! I absolutely love neapolitan stuff! I hear you on the gel food paste… I just did that same exact thing. Too much pink! Haha! I really liked the PINK frosting. Then again I am a PINK person. HA!!! Absolutely love that you made the middle layer cheesecake. Genius, I tell you! That does sound like a labor of love! But glad you stuck with it. This towering cake is gorgeous! Neapolitan ice cream was always my favorite as a kid, so I’m a sucker for those 3 colorful layers! This is absolutely gorgeous looking. I love both versions, but I have to say, I like the pink frosting better 😉 Now I’m totally wishing you lived closer, so I could be one of the ones who takes goodies off your hands. Can I get a slice of that cheesecake? Like right now? MMM this cake looks so yummy! Love these different cake layers. 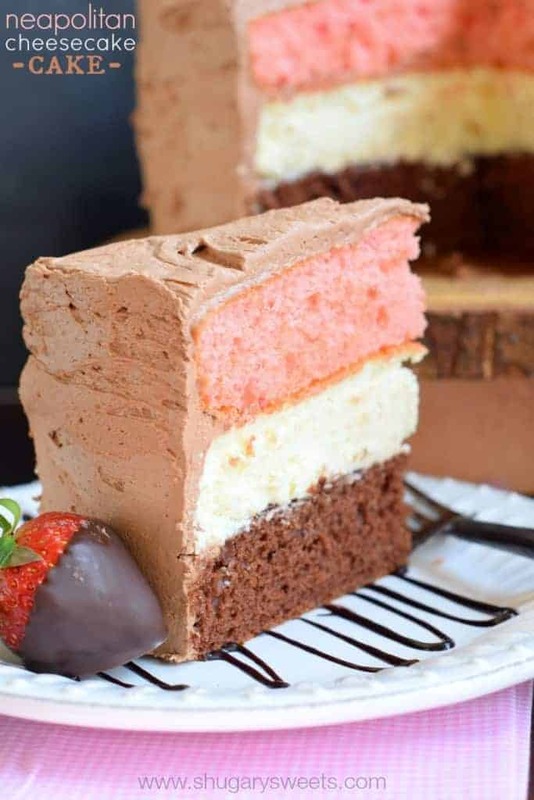 I used to love Neapolitan ice cream when I was a kid, but this cheesecake cake is something that I have to try. It sure looks good. My daughter and I would seriously put a hurting on this cake. Do you think that a cake-like brownie would be too much instead of the chocolate cake layer? 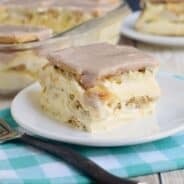 Is there a way to make this Into sheet cake? 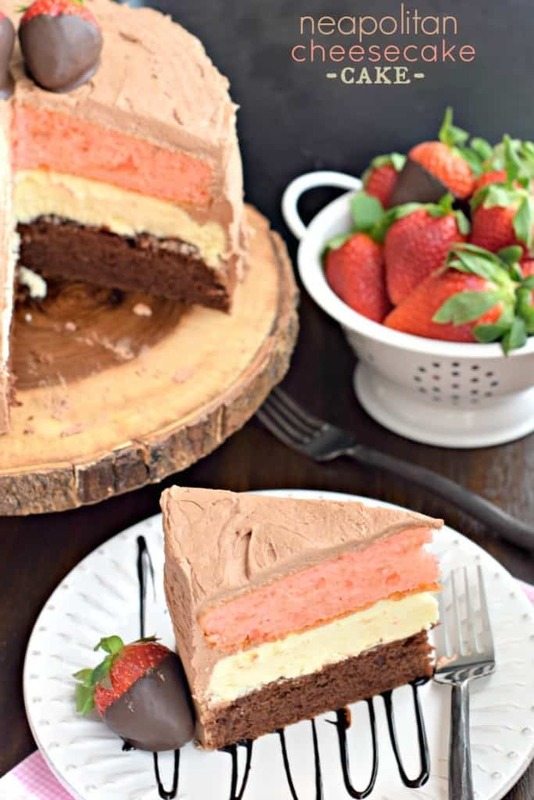 Obviously it would not be a problem for the cake layers, but the cheesecake layer? And if possible, baking time?